Automatic library preparation; get your biological sample ready for analysis, hands-free. Oxford Nanopore offers a range of options for converting your original biological sample to a form ready for application into a nanopore sensing device. Oxford Nanopore has developed VolTRAX – a small device designed to perform library preparation automatically, so that a user can get a biological sample ready for analysis, hands-free. VolTRAX is designed as an alternative to a range of lab equipment, to allow consistent and varied, automated library prep options. VolTRAX is designed to automate sample prep for nanopore analyses. The consumable VolTRAX cartridge is used with a small USB-powered device. 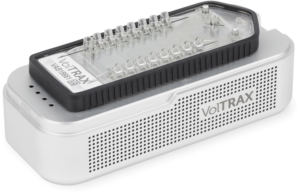 The VolTRAX is designed to allow users to add sample and reagents to the device and then walk away while they are prepared for nanopore sequencing. In VolTRAX, liquids are moved around the cartridge in a path programmed by software, performing individual reactions in sequence.